NPR reports that Girl Scout cookies have become as much of an American tradition as apple pie. Seeing cookies come out is a great sign of spring. 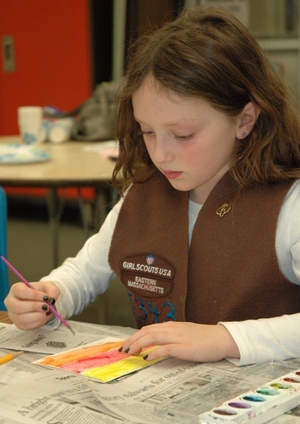 Generations of girls grew up being Girl Scouts. "While they learned to build fire together, they couldn't help but learn about getting along with each other," says the narrator in a 1950s Girl Scout film showing girls in long skirts and white gloves learning about the wilderness. "They seemed to like being on their own." Today, Girl Scouts are still all about blazing new trails. But the frontier has changed. As the badges on their vests show, this is not your grandmother's Girl Scouts. Eleven-year-old Elizabeth Huebner has earned far more badges for science than for sewing. And she'll get math badges for everything from counting money to managing credit and financing college. The Girl Scouts say they're continuing an old tradition of being nontraditional.